Eto is a kind of food that people ate in West Africa. You cooked yams until they were soft, and then mashed them. Then you added eggs and palm oil. This made a rich, satisfying food that people loved to eat. People ate it when they were sick, or if they had no teeth left to chew food. People gave gifts of these mashed yams to the gods, because the gods really liked to eat eto. 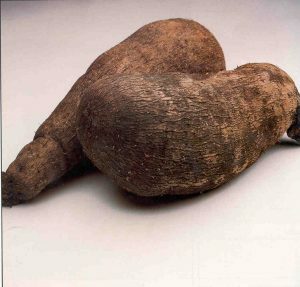 When farmers picked the first ripe yams every year, the priestesses would use those yams to make some eto. Nobody was supposed to eat the new yams until the eto was done and the yams were blessed. Does this remind you of the Jewish holiday of Passover? People kept on eating eto in West Africa into the Middle Ages and after European traders started to come to West Africa. When these traders forced many West African people to go to America as slaves, they took their recipes with them. In America, they cooked sweet potatoes in the same way that they had cooked yams at home. 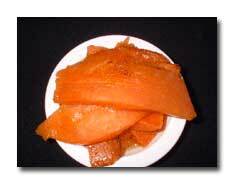 American sweet potato pie, for example, is made with mashed sweet potatoes mixed with eggs and butter or oil. Here’s a West African story about Anansi that has eto in it. Cite this page: Carr, K.E. Eto – African food. Quatr.us Study Guides, May 18, 2017. Web. April 19, 2019.